Is the grass redder or greener on the other side? – The brain is sooooo cool! Is the grass redder or greener on the other side? 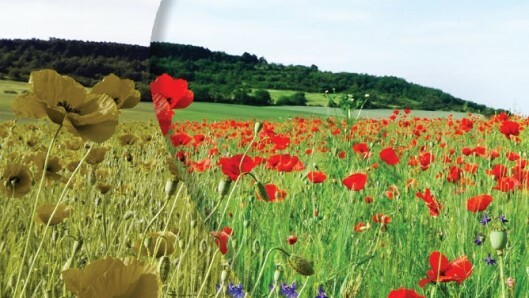 This image is provided by EnChroma and purportedly demonstrates the effect of EnChroma sunglasses on a color blind person’s perception. To the left, the flowers appear dull in color and on the right they appear vibrant red. From gizmag. A few days ago, a friend texted me, Is this for real? followed by a link to an article about a pair of sunglasses that “fix” color blindness. Well, before even clicking, I was certain that the EnChroma sunglasses were no fix or cure. Cures are rare, exceedingly so. We treat conditions, we don’t cure them. Indeed the sunglasses made by EnChroma will alter a color blind person’s perception of the world but are not a cure for color blindness. To understand what the EnChroma sunglasses do, we need to understand a bit more about circuits in the brain that produce color perception. First of all, remember our lesson from that confounded dress that in fact has no color. In brief, recall that light has a wavelength that is one, but not the only, factor in determining the color that is perceived (thank you neocortex!). The world has no color, only the brain constructs color. Okay now back to the EnChroma sunglasses. 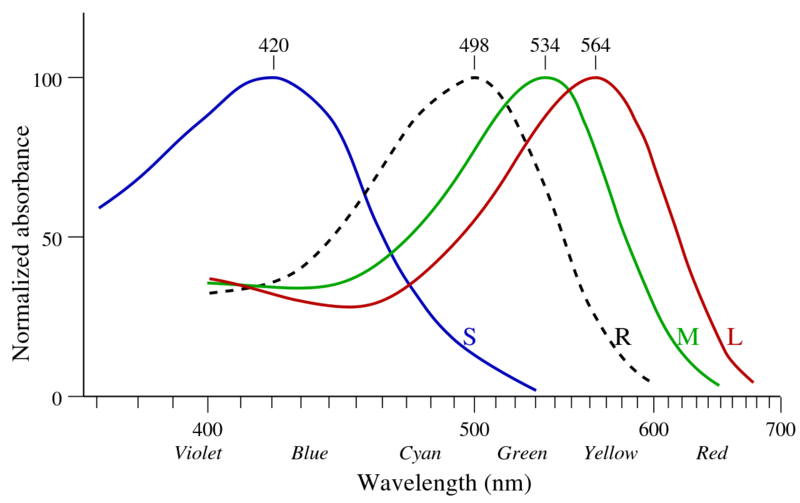 This graph from Wikipedia shows the absorbance spectra of the three types of cone photoreceptors that humans possess. The colors listed at the bottom are the colors that are typically perceived at each wavelength. 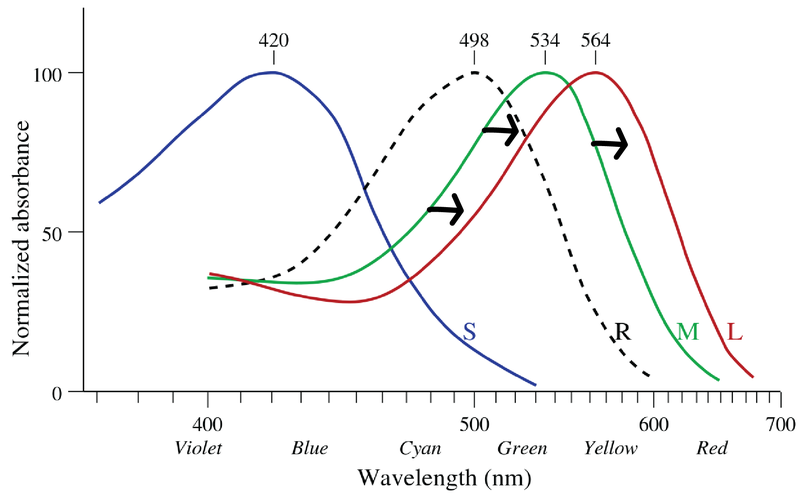 For example, wavelengths of 440 nm or so are perceived as blue by most whereas those of 580 or so are perceived as yellow. These spectra were first described by George Wald and Paul Brown in 1964. George Wald won the Nobel Prize in Physiology or Medicine in 1967 for his myriad contributions to our understanding of the chemical basis of vision. Finally, remember that the vast majority of cones are M or L. S cones account for 5% of the cones in the central retina of the human. [Note added on March 11, 2015: Just outside the fovea, in the macula which serves central vision, 5% of cones are S cones.] Nonetheless, when all three cone types are present and accounted for, in proper working order, we readily perceive the world as colored violet, blue, turquoise, green, yellow, orange and red. Now let’s figure out what occurs in color blindness. The most common types of color blindness are ones involving either a deletion (-opia) or a mutation (-omaly) of the gene for either the M (deteuran-) or L (protan-) cone. The most common of all is deuteranomaly in which L cone function is normal but where the M cone’s absorption is shifted towards that of the L cone. On average, M cone absorption is shifted to the right by almost 20 nm (Pokorny et al 1973). As a result, there is <10 nm between the M and L cone peak absorptions whereas in the normal condition there is almost 25 nm difference. In deuteranomaly, the absorption spectra of M cones is shifted to greater wavelengths and is very close to that of the L cones. While the nighttime driving problems of color blind people may not rank up there with world hunger, it is also true that the problem is easily fixed. What gets me aggravated about this is that the problem is such a gratuitous slap in the face of neurobiology. We can use neurobiology to come up with all manner of solutions, such as lights of different shapes to denote different messages, to this problem! Upon hearing this story, my spouse’s comment, “I say paint the grass red.” Seriously, everyone, abiding to a story that the grass is green, the sky blue, and so on is so not worth humiliating a child. We’ll come back to this. And now, how do those sunglasses work? Now, let’s consider what would happen if you removed those wavelengths that are confusing to a person with shifted M and normal L cones? The strategy used by the EnChroma engineers is to remove a chunk of wavelengths that could not possibly be distinguished by deuteranomalous M and normal L cones. Without the middling wavelengths around to muddy the picture, M and L cones would rarely be activated to the same extent because the wavelengths that could do so have been artificially filtered out of the optical input. How would this be interpreted? Well let’s assume that a person with deuteranomaly has a normal M vs L channel; or in other words, that the retinal circuits that give rise to L-M are present in the color blind individual. The L-M channel simply doesn’t get normal input from the M cone. So now objects that have more wavelength content below the bottom cutoff of the filter and those that have more wavelength content above the top cutoff of the filter will get that M vs L channel really going, really jazzed up in a way that would never occur in the color blind individual without the notch filter provided by the sunglasses. In nature, the light from objects is mixed in wavelength. But when a notch of wavelengths is removed, then voilà the “color blind” person sees a difference between M and L wavelength light. Finally remember that luminance depends on summing input from M and L cones. So along with perceiving an enhanced difference between objects with medium and long wavelength content, there will be a large drop in luminance. As a colleague said, “that’s why they are called sunglasses.” Full photopic conditions are needed to use these glasses because of the large drop in luminance that they produce. As I was writing this post, I came across George Wald’s Nobel Prize acceptance speech. George Wald received the Nobel Prize in Physiology and Medicine for his many contributions to our understanding of the chemical basis of vision. He figured out the importance of vitamin A to vision, uncovered many of the steps of photoisomerization, measured the absorbance spectra for cones and rods, and described the molecular basis for color blindness. When I looked at his Nobel Prize speech, I realized why George Wald received the Nobel Prize and neither Paul Brown nor Ruth Hubbard did. His contributions were many, many; only some of which each of his collaborators were in on. But what really struck me was the diagram below. It shows Dr Wald’s account of the distribution of different cone types in the retina. As it turns out, there are no S cones in the fovea. In fact the only region of the retina that has the full compliment of three cones is an annulus that goes from the outer ring of the fovea to an eccentricity of about 30°. Then there is a region where the retina absorbs light as though it were “red-green color-blind.” Finally the most peripheral region of the retina “behaves” monochromatically. 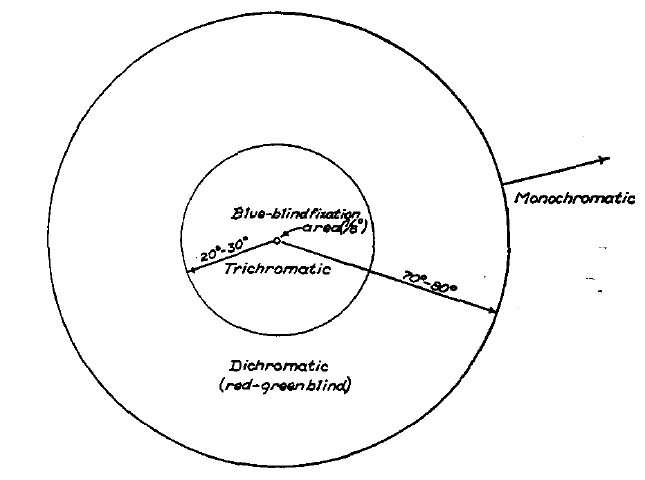 This diagram shows the different chromatic competencies in four areas of the retina (fovea, out to 20-30 degrees, out to 80 degrees and then the extreme periphery). In the fovea there are no S cones. In the inner 30 degrees (and outside the fovea) all 3 cone types are present. Stimulation in an annulus outside of that does not lead to trichromatic color perception but supports color perception similar to that of color blind individuals.Light that hits the far periphery does not result in color perception. From George Wald’s Nobel Prize speech in 1967. 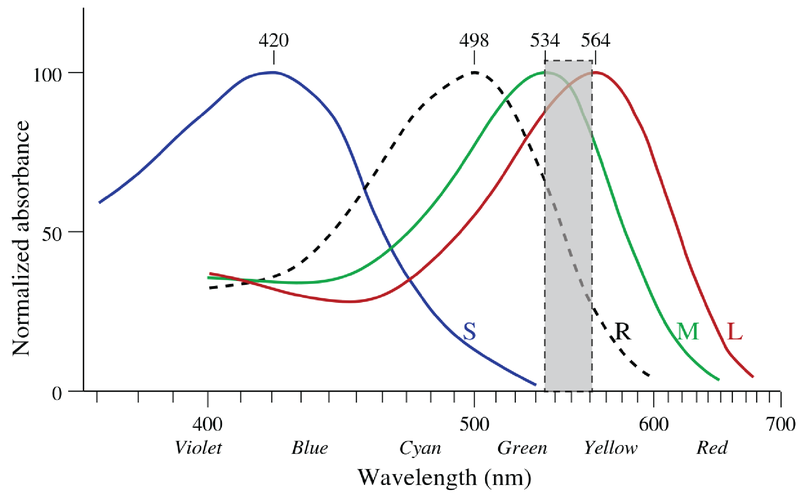 In essence, Wald is saying that our normal color perception is only supported by a restricted region of retina and that we all have red-green color blindness in great swatches of the visual field. I will make just a few comments. First of all, I have no idea if this has stood up to the test of time. Second, I do not perceive a difference in my color perception across the visual field. And finally, I am sure that many of you are saying to yourselves, “Peggy does not know what she’s talking about…. Here is a Nobel laureate using color words to describe light.” I was a bit surprised. However the reality is that neuroscientists and biologists are often not well versed in the difference between perception and sensation. The critical idea that stimuli have no qualia until they are given perceptual content by the brain is an insight that we owe to psychology. Thank you, psychology!! Let’s spread the word to neuroscientists everywhere. How can the sunglasses work if we have to learn how to perceive? Okay great. So we have an idea of how EnChroma sunglasses work. While not a fix for color vision, these sunglasses will enable a color blind person to distinguish objects that he could not otherwise distinguish. But would a deuteranomalous person wearing these sunglasses perceive red and green as I and others with normal color perception do? My intuition tells me no. If an individual grows up without perceiving red and green then how could just a change in the light coming in make them perceive red and green? The impossibility of such a miracle is illustrated by a person who has been deaf since birth and receives cochlear implants as an adult. Can this person now hear normally? Can s/he make sense of audio input? No and no. We need to learn how to perceive. Cochlear implants after the age of about 3 years do not provide hearing to congenitally deaf individuals. And a person with color blindness is simply not going to perceive colors as those of us who are not color blind do. As I was pondering this problem, I came across a fascinating article by Kevin Loria. What Mr Loria describes is that blue is a relatively recent concept. William Gladstone, the great English politician who served as prime minister of England during much of Queen Victoria’s reign, noticed that classic texts did not use the word “blue.” Languages did not even appear to have a word for blue until fairly modern times. Light was described as black or white with the occasional reference to red, yellow, or green. Blue? No. Nary a mention. “Guy Deutscher, author of “Through the Language Glass: Why the World Looks Different in Other Languages,” tried a casual experiment [aimed at figuring out if a blue sky is a universal perception.] In theory, one of children’s first questions is, “Why is the sky blue?” So he raised his daughter while being careful to never describe the color of the sky to her, and then one day asked her what color she saw when she looked up. 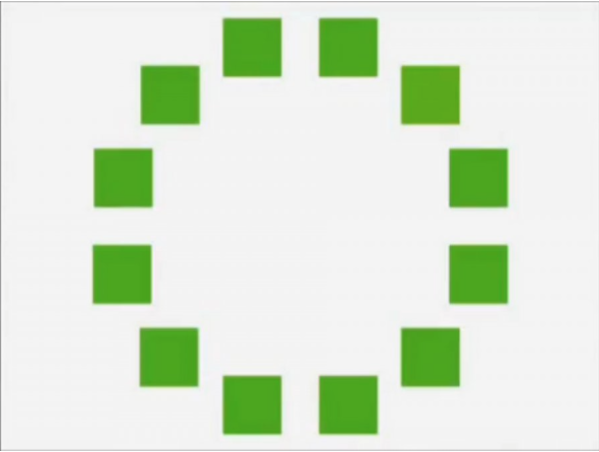 Can you tell which square has a different set of wavelengths than the others? For the answer you’ll have to go to the Business Insider article from which this is taken. I cannot do this. I tried and I guessed. I was wrong. Even knowing the answer, I cannot see the difference. Remarkably I showed the above image to my friend Emily B, who immediately and correctly picked out the square of a different green shade. Emily told me that she is aware of her unusually discerning color perception but that she did not consciously develop it. She simply became aware of her abilities through taking an online shade test. So once again, we come back to the idea that we construct our perception of color. Part of what feeds our individual construction is the photopigments that we have in our cone photoreceptors. But that genetic starting point does not dictate our color perception. Clearly culture weighs in. Despite pollution’s effect on light refraction through air, I suspect that the same wavelengths come off the sea as did when the ancient Greeks were around. They called it wine red and we call it blue. So bottom line, Bob, you can tell your teacher that grass is just as red as it is green after all. Oh, what a rich topic! I can’t resist expanding it with a bit of a Russian perspective. One of the puzzles that every Russian speaker studying English has is that you use one word — “blue” for what we think are two distinct colors — “синий” and “голубой”. (“siniy” and “goluboy”, or dark and light blue). They compared native Russian speakers to Americans in the color discrimination task. And actually, Russian did have a category advantage when distinguishing the colors that are different in our language, whereas English speakers did not. The authors didn’t stop there: this Russian advantage was destroyed if subjects were forced to rehearse a number sequence during the color discrimination. So the “brain word department” gets involved in color discrimination, and if it is otherwise occupied it fails to provide the advantage. Fascinating. The PNAS article on Russian and English speakers was fascinating. I was bothered by the huge difference in reaction times with Russian-speakers being so much slower than English-speakers. I understand that the authors think that the Russian subjects are simply less used to participating in psych-tests but I would love to see confirmation of that. Match the two test populations for their familiarity with testing and their reaction times and then do the test. Nonetheless the results are interesting and suggestive. The video of the Himba was great. [I totally did not understand what was going on with the babies. What was being measured? What was the logic?] I liked the visual as to what the various Himba words refer to in color perception. It is as though the colors are divided up based on something besides wavelength – intensity, saturation, something along those lines? And the color charts seem to support that idea although it was hard for me to read the charts. I agree – cones are the same, qualia are not. All so interesting. I am very thankful to you for commenting and providing all these interesting thoughts and links. It is worth watching; note how a researcher interviews a tribesman: they claim that water and milk are the same color, and the sky is “black”. (it is a different tribe from the region, but the same principle applies). What is fascinating and revealing is that these people seem to loose their color perception for very light or very dark colors. They only perceive the most vibrant versions of them. Well, “perceive” in terms of language-affected qualia; I bet their cones are distributed quite the same way as ours. Interesting! But it’s probably not true that after the correction the colour blind person will see green and red very differently (there is probably some difference). The ultimate proof would be to test those glasses on a unilateral deutanomalous person (i.e., colour blind in one eye) but it looks like the visual cortex is actually extremely “stubborn” and able to construct the normal image even after decades of anomalous inputs. It would simply be as if someone grew up in a particularly “drab” neighbourhood. As an example, notice that tetrachromatic people exist (like your friend Emily B.) which means that the visual cortex is STILL able to process four channels, despite the fact that through evolution we dropped tetrachromatic _retinas_ very long time ago. I agree with your point. This is puzzling. How can a person who has never learned red and green color perception all of a sudden use input from the retina to see something that they had never perceived before? At the same time, I was really struck by the reaction of color blind people using enChroma glasses for the first time. Surprised that they could process the signal enough to be so emotionally moved. Of course, this could be acting and advertising (cynically possible but I doubt it). Alternatively maybe the M vs L channel gets hooked up even without proper cone input and then the person perceives differences in the color that they perceive from M to L wavelength light. In any case, you have identified a proper mystery. To paraphrase Stuart Firestein, ignorance is where it’s at, so much more intriguing than facts.